In the future, car seats will need to offer better whiplash protection to earn a top safety score from EuroNCAP. Starting in February, new test procedures will mean fewer cars will earn EuroNCAPs five-star rating for crash safety. -- It reaches a set standard for pedestrian protection. Of the 30 cars tested most recently by EuroNCAP, 17 earned five stars and 12 were awarded four stars for adult occupant safety. Yet the average score for pedestrian protection was less than two stars -- just half the possible maximum of four. The changes are part of a sweeping overhaul of the EuroNCAP safety rating system, which will result in a single overall score for the whole vehicle rather than three separate scores. EuroNCAP (short for European New Car Assessment Program) is a government-supported, independent car-testing organization. Automakers strive for high EuroNCAP ratings to help promote the safety of their cars to consumers. 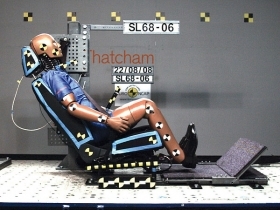 Since the EuroNCAP system was introduced in 1997, ratings have been provided for adult occupant protection. Later, separate scores for child occupant and pedestrian protection were added. Although there are three different tests, this system enabled automakers to claim a five-star result even though the cars pedestrian or child safety performance was inadequate. *Based on test results for frontal impact (top score: 16); side and pole impact (top score: 8 each); and whiplash protection (top score: 4); Note: EuroNCAP puts more emphasis on adult occupant protection results. The points here are worth approximately half in the overall score. The new system is designed to give consumers a clearer picture of the differences between models and to give automakers higher safety benchmarks to aim for, EuroNCAP, Secretary General Michiel Van Ratingen said. In particular, we want to encourage manufacturers to do much more for pedestrian protection and to make sure they move toward standard fitment of ESC [electronic stability control], van Ratingen told Automotive News Europe. Van Ratingen was speaking on the sidelines of a EuroNCAP event to launch a new area of safety that it will assess -- the whiplash protection offered by a cars front seats. In results released last month from the organizations first round of whiplash tests, only five out of the 25 seats assessed were rated as good. That means they earned between three and four points, which is the top score. Twelve seats were rated marginal, while eight earned less than 1.5 points and were classified as poor. According to EuroNCAP, a persons risk of suffering a long-term injury from a low-speed rear-end collision is significantly higher in seats that earned a poor score. Three of the eight seats that earned a poor score are in cars that had just scored five stars for adult occupant protection -- the Citroen C5, Ford Kuga and Peugeot 308CC. The Peugeots seat was one of three to score zero points. In the future, it will be impossible for a car with such a low whiplash-protection score to get five stars overall, Van Ratingen said. The new single overall safety rating will combine results from the three familiar areas -- adult, child and pedestrian protection -- but will add an important fourth heading: safety assist, or the ability to avoid an accident. This, said Van Ratingen, will include seat-belt reminders, ESC and speed-limiting devices. ESC is expected to be mandatory in Europe for all new cars by 2014. Before that happens, models sold in Europe in 2009 only will be eligible for five stars from EuroNCAP if ESC is standard equipment in half of a the cars lineup and optional for another 35 percent of the cars production. To get five stars in 2010, ESC has to be standard in 90 percent of all of the cars unit sales in the 27 EU member states. Starting in 2009, said Van Ratingen, points would already be awarded for some speed limiter systems. EuroNCAP expects to have its assessment framework for advanced speed limiting devices ready by 2010. Including pedestrian protection ratings into each models overall score will have a big impact on the overall star ratings that automakers will be able to publicize. Most cars sold in Europe score poorly on EuroNCAPs test for pedestrian protection. 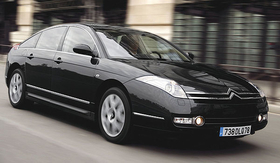 One exception is the Citroen C6, which earned a top score of 4 stars. Starting this year no car with a pedestrian score below two will be able to gain a five-star overall rating. By 2012, the pressure to improve pedestrian protection will increase. Only cars with a pedestrian safety score of 3.5 or more will be eligible for a five-star overall rating. The highest score so far in almost eight years of pedestrian protection assessment by EuroNCAP is four. That score was earned by the Citroen C6, which has a pop-up hood. Ford, for one, says that the upgraded requirements represent a significant challenge to car manufacturers. Ford, said Thomasen, is looking forward to working with this group during 2009 and arriving at a better, more repeatable and consistent procedure for assessing pedestrian protection.